She used to sleep on top of the big run, but recently she’s been…somewhere else. The first time I couldn’t find her, I thought she’d been taken by a fox, coyote or other predator. But then, the next morning…there she was. The second time it happened, I tried to find her. Was she roosting in a tree? No. Was she hiding in the swales? No. Was she sleeping under the chicken tractor? Again, no. 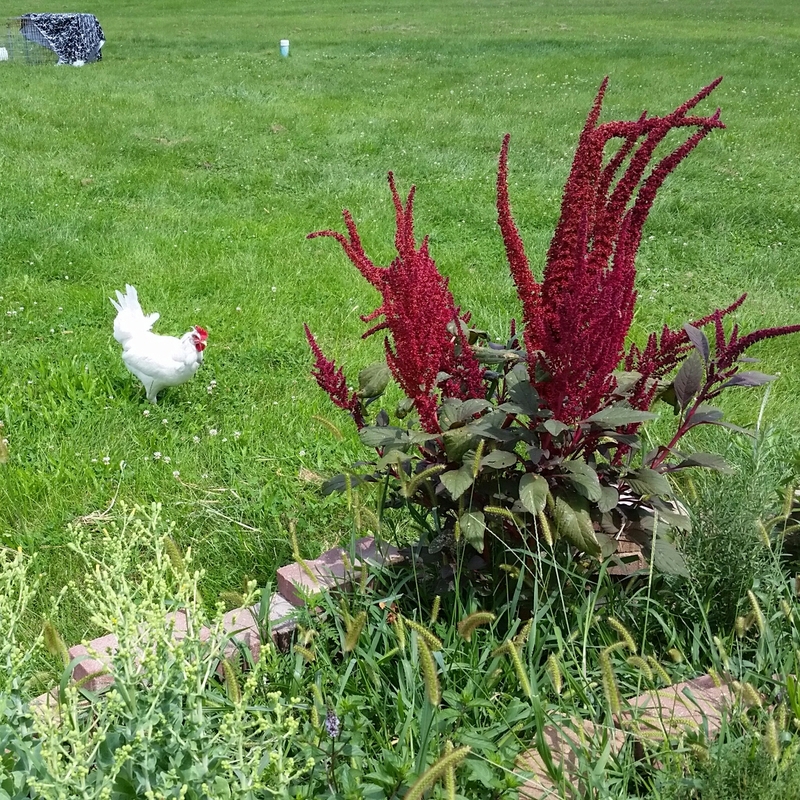 Then yesterday, while I was watering the chickens, I saw her running from the back of the house. Maybe she’d been sleeping under the deck. As I walked toward the garage to refill my watering can, I noticed a small gap in the tall, ornamental grass by the house. I got closer and saw a patch of white. I crouched down and peered into grass…and there it was. 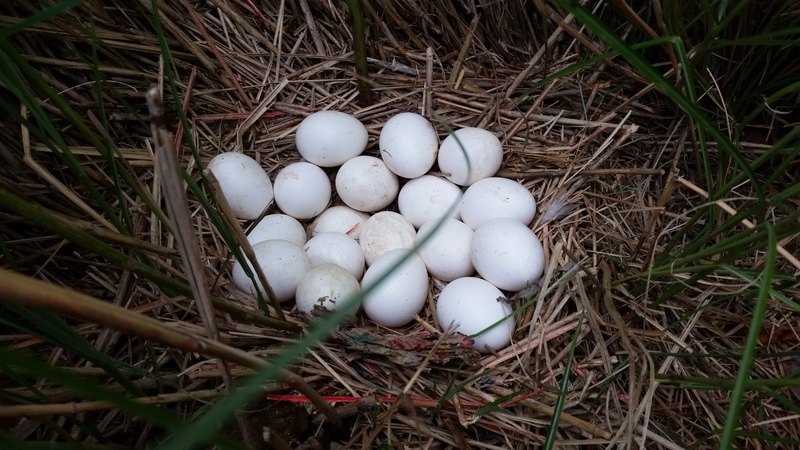 A big clutch of eggs. Almost a whole month’s worth. 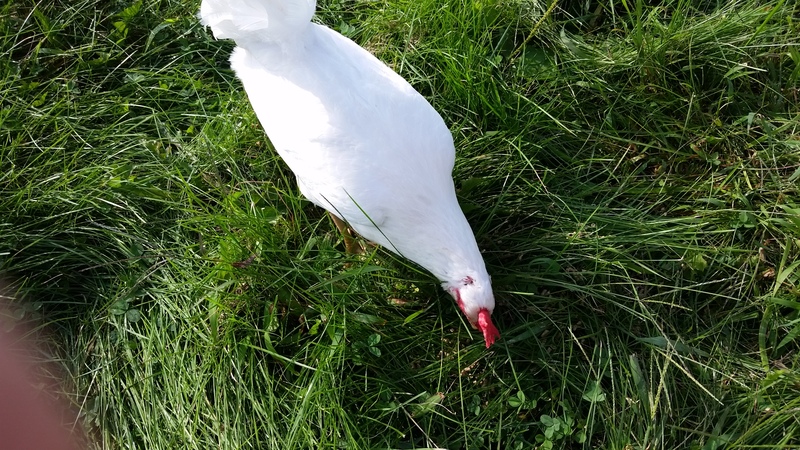 So I sat down and did some research on Backyard Chickens, one of my favorite go-to sites for questions on all things chicken. It hasn’t steered me wrong yet, and the forum is chock-full of great questions and answers. 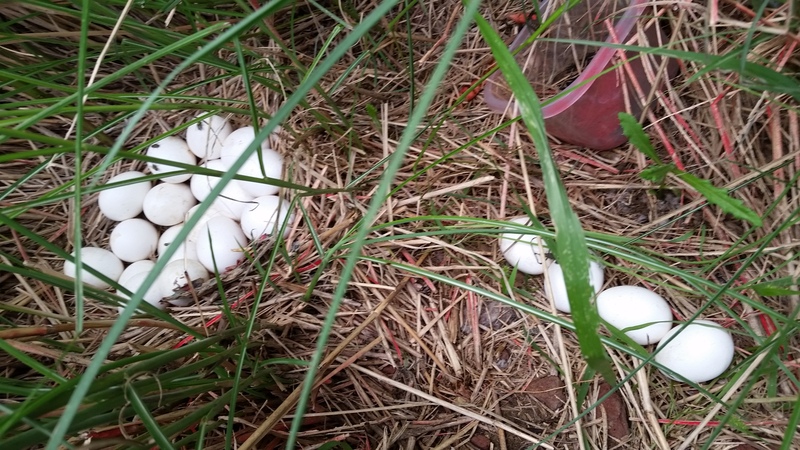 I found a question posted by someone who had found a clutch of 15 eggs in an old dog crate. She asked the question I needed an answer to: How long do eggs last when left outside? All of the answers said almost the same thing: test them first, but eggs can last for weeks outside. Another site I sometimes go to for answers brought up a great point: What did people do before refrigeration existed? And all of the sites I visited said that hens don’t start incubating their eggs until they have a clutch, or 12-14 eggs. Hens lay up to 1 egg/day so it would take weeks to get that many. If any are rotten, the hen knows and will roll them out of her nest because a chick cannot hatch from a rotten egg. So, rather than throw them away, I tested them. I did the float test. If they sink and stay on the bottom or stand on their ends…they are still good to eat. Only four floated. 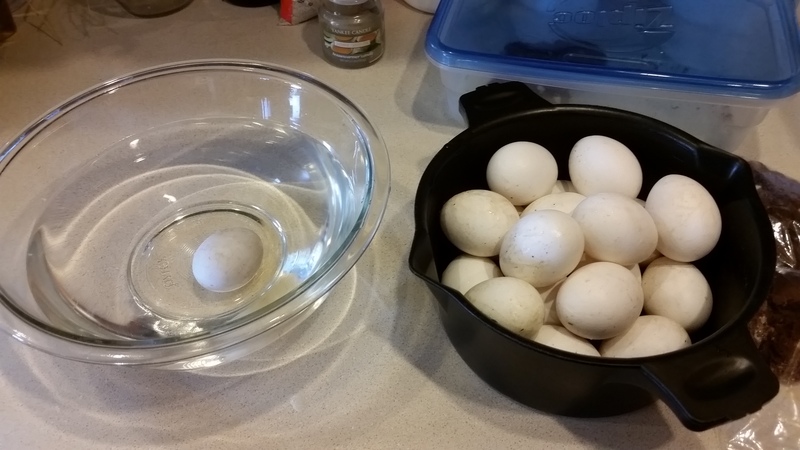 This method is not foolproof, so I cracked the eggs one by one into a bowl. If the yolk is a deep golden yellow, the eggs are still good. 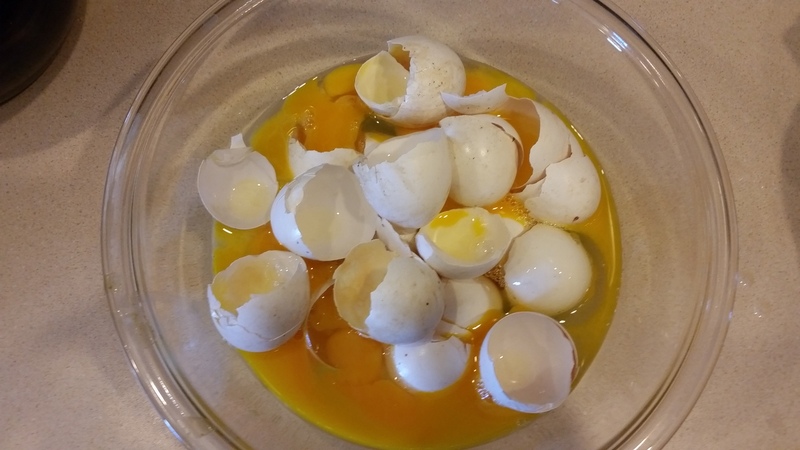 I poured the good eggs into another bowl to scramble–shell and all–cook and feed to the chickens for a calcium and protein treat. If the yolk is brown, that means they are rotten. 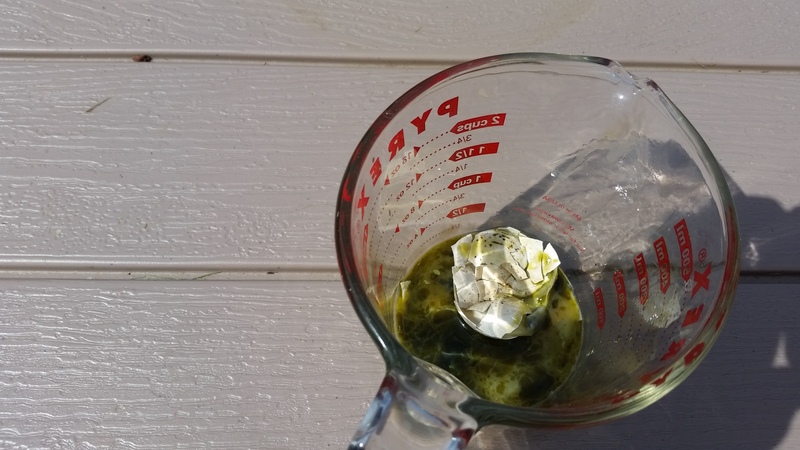 Curious, I cracked one of the eggs that floated. It was perhaps, the biggest mistake I have ever made. Through the horrible haze of the more-than-disgusting smell, I barely noted the dark brownish, greenish yolk. I mean really, really awful. I will never again say “It smells like a rotten egg” unless I am referring to an actual rotten egg. Nothing smells as bad as a rotten egg. It was so disgusting that I ran outside gagging and dumped it in a bucket along with the other three that floated. I’m gearing myself up to go back out with a ziploc bag, or maybe 10, to try and seal the smell off from the rest of the world. No one should have to experience that horrible, horrible smell. My diffuser is now running full speed, filling the house with a lovely, lavender scent. I’ve scrubbed my hands and bleached the counter where some of the egg white fell. I don’t think I will ever be able to smell pleasant smells again. This entry was posted in Chickens!, Haiku. Bookmark the permalink. I’m so glad I did it that way!